A warm brass finish is complemented by the satin white glass bowl and uplights of this eight-light chandelier. The Deco collection is inspired by Art Deco style chandeliers from the 1920s. This design features bands of warm brass finish metal and satin white glass for a clean look. From Possini Euro Design, this sharp and stylish eight-light chandelier is a great look for kitchen lighting, hallways, entry ways, and more. 31 3/4" wide x 26" high. Canopy is 5 1/4" wide. Weighs 27.5 lbs. Uses eight maximum 100 watt standard-medium base bulbs (not included). 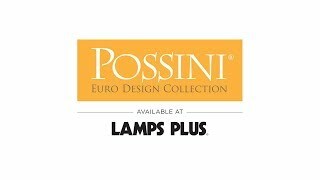 Deco inspired bowl chandelier with eight-lights from Possini Euro Design®. Warm brass finish frame, arms, and canopy, with satin white glass bowls. I selected three chandeliers with same warm brass color for kitchen, dining area and foyer. do you have in store pic-up? Hello, Does this have 220 volts capacity? Can it be used in Europe and Africa? BEST ANSWER: Hi - All of our products are made in the standard USA 110V electrical system requirements. Please check with a certified electrician in your country if our products can be installed. Can the bowl light be turned on separate from the uplights? BEST ANSWER: Hi, no all the lights will turn on at the same time. No, all the light come on together. However, you can put the chandelier on a dimmer. Is it a hard wire lamp? BEST ANSWER: Hi - yes, this is a hardwired chandelier that requires electrical installation. One problem in this category........I bought the chandelier at the store. saying the error has been corrected. PLEASE CORRECT AND ADVISE. Quality made chandelier; looks very nice installed. Service was superb Received fixture well ahead of scheduled delivery date.